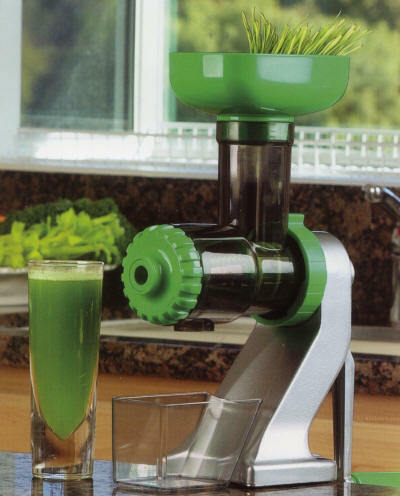 Unlike other manual wheatgrass juicers, the Z-Star has the ability to juice other produce items besides wheatgrass. Wheat Grass Juice contains approximately 70% Chlorophyll. Chlorophyll has show to have many health benefits and has proven to be a natural body cleanser, rebuilder, and neutralizer of body toxins. 13" x 11.5" x 5"
How long does it take to juice with the Z Star? We juiced two pounds of carrots in about 10 minutes. The juice was a fair bit pulpy, so we reccomend straining it after it comes out of the juicer. Do you already own an electric Single Auger Juicer? 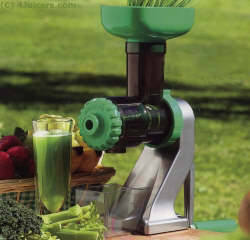 We offer the Z-Star Conversion Kit to convert your juicer to run without electricity!